Djer - Dynasty 1: Second King of the First Dynasty Horus Djer (Manetho's Athothis) or Itit (his nomen) is said to have reigned for 57 years. Son of Aha and Hent (or Khenthap), built a palace at Memphis. Second King of the First Dynasty Horus Djer (Manetho's Athothis) or Itit (his nomen) is said to have reigned for 57 years. 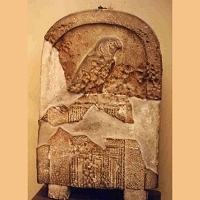 Son of Aha and Hent (or Khenthap), built a palace at Memphis; whose wife was Queen Herneith. There are also indications of a possible military campaign against a country named Setjet, probably Palestine or Sinai. Evidence comes from ivory and wood labels from Saqqara and Abydos. Around his tomb at Abydos (Tomb O) were over 300 satellite burials of retainers who had gone to the grave at the same time as the king. Inscription from the tomb 3035 in Saqqara. The tomb belongs to the official Hemaka, who served under Den.